At the Khlong Phai prison, Thai prisoners vie for an early release for successful participation in sanctioned Muay Thai kickboxing matches against foreign combatants. This practice for an inmate's freedom is time honored as legend has its beginning in the eighteenth century. In a story that dates to 1774, Thai fighter Nai Khanomtom found himself in a Burmese prison where he was forced to fight nine Burmese champions in a row for King Mangra. Khanomotom defeated every opponent and the Burmese king was so impressed that he granted his freedom along with two wives - giving birth to a tradition of pardoning outstanding fighters. 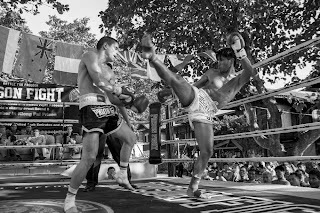 Muay Thai - the Art of Eight Limbs (use of fists, elbows, knees, and feet) - is a brutal fighting style that pre-dates Okinawan karate by centuries. 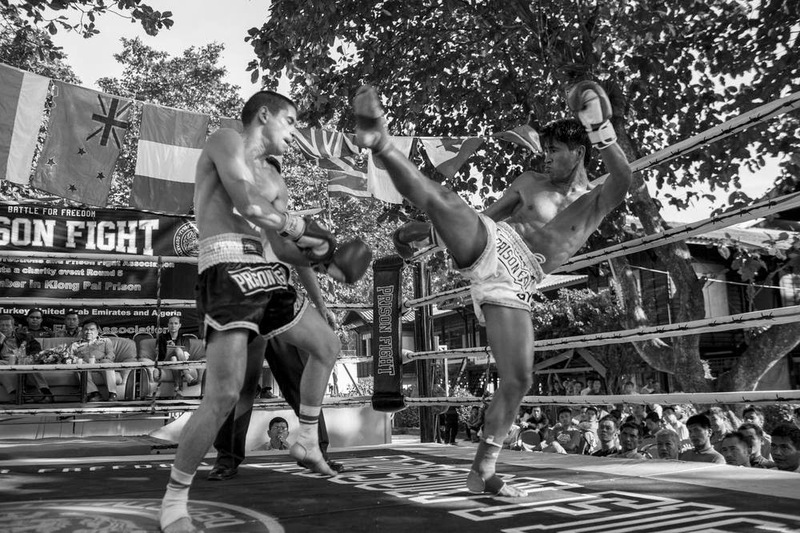 Most MMA fighters have incorporated the training regimen and techniques of Muay Thai into their fighting arsenal. Thailand's Department of Corrections sanctions these bouts, simply called "Prison Fight." Fighters are paired up on the spot, loosely based on height and weight. In addition to a reduced sentence, inmates who win are entitled to cash prizes. The more fights a prisoner wins in the tournament, the more his sentence is reduced. (A prisoner's behavior is carefully assessed prior to release.) Not surprisingly, the Thai prisoners win nine out of ten fights against their foreign opponents.